Dr Parakrama Dissanayake , Secretary to the Ministry of Ports & Shipping and Southern Development presenting the final draft of the National Policy for Maritime and Logistics Sectors to Minister of Ports & Shipping and Southern Development Sagala Ratnayaka. 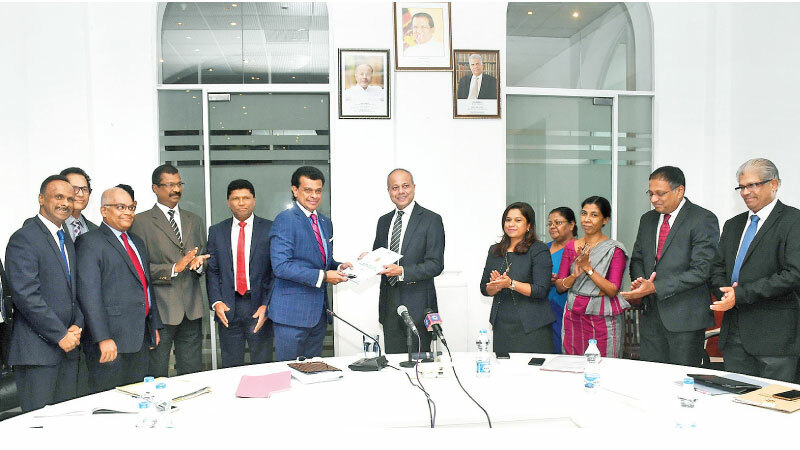 Chairman of the Sri Lanka Ports Authority Kavan Ratnayaka; Managing Director of the Sri Lanka Ports Authority Captain Athula Hewawitharana; A W Seneviratne, Director General of Merchant Shipping; H D.A.S. Premachandra, Chief Executive Officer LAUGFS Terminals Ltd; K N Kumari Somarathne, Additional Secretary (Development) of the Ministry of Ports & Shipping and Southern Development; H. M. L. S. Herath, Additional Secretary (Admin and Finance) of the Ministry of Ports & Shipping and Southern Development; Shehara Jayawardana, Group Joint Managing Director of McLarens Group; Saliya Senanayake, Chairman, CASS; Romesh David, CEO of SAJT were also present.